Stick incense that is a pleasant variation of our sandalwood incense. Otherwise, the incense will be send separately by first class mail or priority mail. In this case, it will cost more than the shipping charge noted. 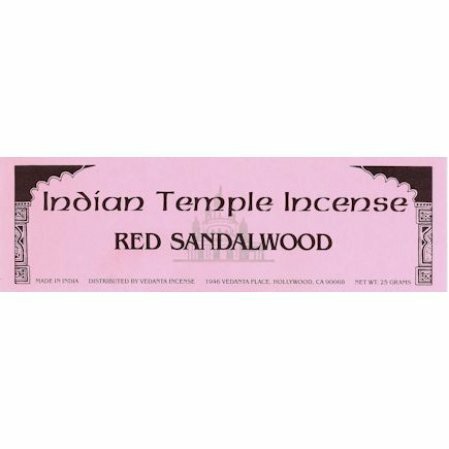 I love the Red Sandalwood incense and especially like the ability to get it in the larger 100 gram size. This scent is new to me and I like it very much. The incense are not too thin so they don't stop burning before finished. The diameter is perfect. Wonderful tone of Sandalwood that is not sweet and lasts for many hours in the environment of the house. It is not as strong as to become a headache. High quality incense as it is expected from Indian Temple Incense. I use it for special occasions.